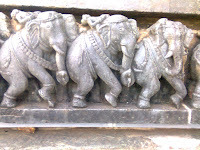 In Halebidu: There are frequent bus services between Belur and Halebidu. I took KSRTC bus from Belur to Halebidu (18KMs - charge 13Rs), and reached the Ruined City - Halebidu literally means 'Ruined City'- around 11am. 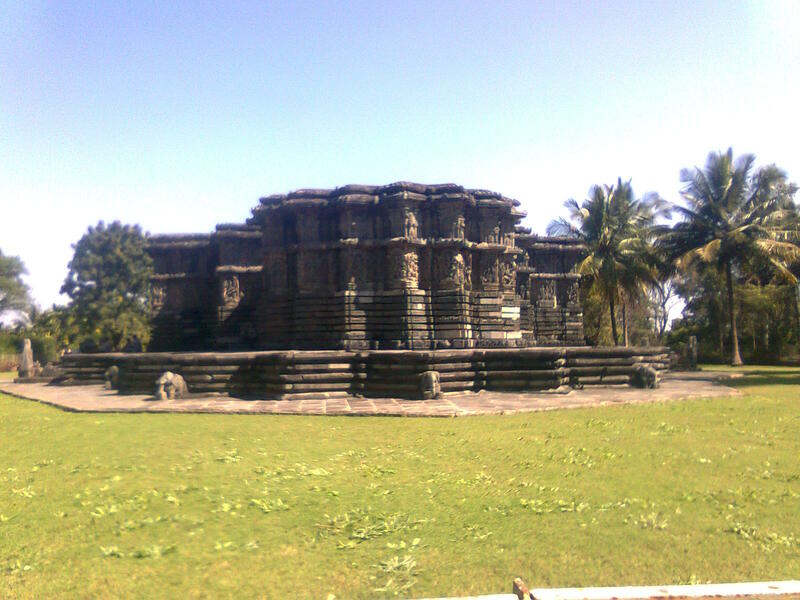 Halebibu is home to Hoysaleswara temple, Kedareswara temple and three other Jain temples. There is big lake on one side of the temple. May be it is because of sunday morning a lot of people were there to see these temples. ASI is doing a good work in maintaining the temples and adjecent areas. Hoysaleswara temple have two beautifully carved monolithic statues of Nandi and an archaeological museum. 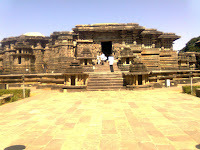 These temples constructed using soap stone is yet to be completed even after the labour of 86 years. 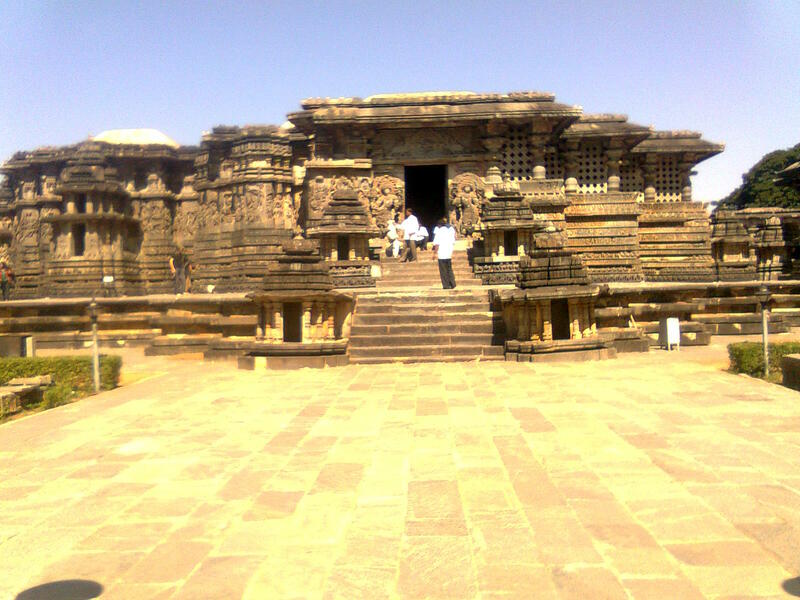 After the sacking by Malik Kafur and his armies in 14th centry these temples went to a state of neglect. The outer walls were beautifully decorated with the elephants, lions, various dancing igures and scenes from Indian mythology. The statues of dwarapalikas and their dresses are an excellent piece of work. After spending considerable time in Hoysalesvara temple, I went to see the lake (only some meters away from the temple) and then headed towards Kedareswara templ which is at a distance of half a kilometer. When I reached Kedareswara there are around 2-3 people and the temple was closed anyway the person in charge of temples opened it for me. This temple also contains some beautiful works in stone. 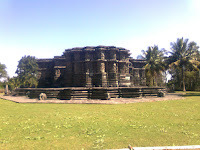 After that I went to the nearby Jain temples and then headed to Bus stand to catch the next bus to Belur. From Belur I retraced my route to Bangalore (Belur - Hassan - Bangalore around 226km). ﻿﻿﻿﻿﻿﻿Overall the trip was good and informative. Its is one thing to read about these pleaces in books and actually go and seeing it. There is no restriction in photography in any of these places, except using tripod and flashlights (this required prior permission). Everywhere it is written that - don't touch the statues, but people are not bothered about it. Aren't they ready to accept the fact that these stone structures after withstanding everything for a millennium is quite vulnerable to external pressure? Even the platform in which the temples are built have to be protected from the pressure of tourists- otherwise the future generation may see it only in books. "Sāre jahāñ se acchā hindostāñ hamārā.."